Find your ideal holiday villa in Lanzarote. Browse our selection of Lanzarote villas available for rent by clicking on the resort of your choice below. Our range of villas in Lanzarote extends from small, well appointed properties through to large luxury villas with private pools. With accommodation encompassing all of the main resorts as well as a good selection of rural villas in Lanzarote with rental prices to suit all budgets. Lanzarote villa holidays provide an excellent alternative to hotel based breaks, providing visitors with much greater independence and more privacy. And often with better amenities at a much lower price too. For example, many villas in Lanzarote now offer extras such as ADSL connections as standard. Along with other facilities such as Jacuzzis and hot tubs. Which would normally only be available to guests in five star hotel accommodation. We work with the owners of Lanzarote villas to provide you with the best possible selection of holiday accommodation available. And as we take no commissions we are often able to offer holiday villas in Lanzarote at lower prices than you will find elsewhere. Virtually all of our Lanzarote villas boast private pools, often heated. And all are well maintained and presented. Ensuring that you enjoy a top quality holiday here in Lanzarote. The island is an ideal holiday destination for visitors of all ages. Offering loads to do and see. From fantastic beaches and picturesque white washed villages through to the incredible creations of the local artist Cesar Manrique. Who fought to ensure that Lanzarote was not swamped by over development. As a result visitors will find that there are no high rise buildings or advertising hoardings blotting the landscape. As a result the island remains much more unspoiled than some other destinations in the Canaries. 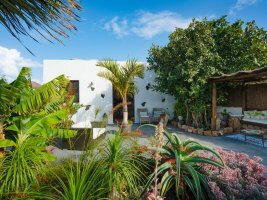 Offering the ideal environment for a relaxing villa holiday in Lanzarote. Villa Luna is a modern, bright three bedroom villa. Villa Mahuna is only ten minutes away from the town centre. A spacious four bedroom villa in the Parque del Rey area. A stylish villa with great sea views in Montana Roja. As the name suggests, this villa is in the Papagayo area. Villa Ladera's location allows you to make the most of its amazing views.